The Oscars came and went. I didn’t expect this year to be so bloody predictable, but oh well. The Oscars are more entertaining when something unexpected happens, and Sunday’s show was so friggen boring. Even Steve Martin and Alec Baldwin were so-so. I miss the original song performances… Anyway. Enough about that. My predictions were incorrect. Moving on. It’s my pleasure to announce that my plane ticket to Chicago has been confirmed by Expedia this morning. That means that come July 9th I’ll be on a flight to the windy city to take the summer intensive at the iO Theater. It’s a five-week program and the class culminates in a show on August 12th. So if you find yourself in Chicago on that date, come see me! I can’t express my enthusiasm. I can however give you three things that have been making my past week awesome. I’m surprised at all the people who started watching LOST and have bailed because they weren’t getting the answers as quickly as they wanted. There are a lot of people who enjoy asking a LOST fan the question, “Are they still lost?” Ah-haa… The great thing about this show is that every time you think you know what’s about to happen, you get spun on your head and they blow you away. Example: Claire mercilessly plunging an axe into the stomach of an Other. WHOA! This season is pretty phenomenal and I’m ready to accept that a lot of the questions I have will be up to me to figure out. LOST is notorious for offering a billion clues, but never outright stating the answer. We now know what the monster is. We know about the numbers. We are even getting more and more clues to “the sickness” that has been hinted at for the past six years. I will sincerely miss LOST when it’s gone… I just hope that we figure out why Libby was in Hurley’s mental institution! Eff! 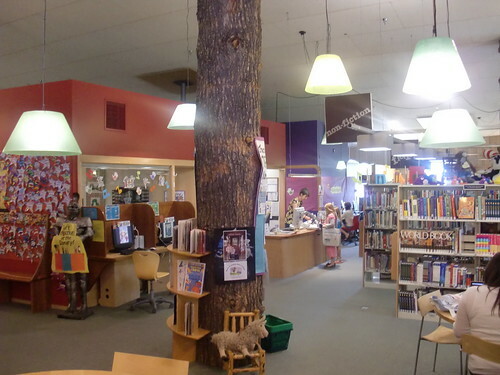 Working on the final draft of my novel has been an intensely draining experience (as described in my previous blog entry) but the one place that is able to calm me down and force me to focus is our local library. No it’s not the most quiet place in the world, and there is definitely this creeper Mexican who stalks me and watches me, but overall I can get my work done. I stick my headphones in, find an empty table, crack the laptop and type away. Recently my writing playlist has been the soundtrack for “A Single Man” which is very Philip Glass-esque, and really calming. My new goal is to spend a few hours here all week so I can get my first 50 pages perfect to send off to a literary agent in New York. Monday is my deadline! Wish me luck. 3.) CAN I HAVE YO NUMBER? More writing for me today… And if you’re looking for a new band, just found these guys called Broken Bells. Pretty great stuff. Google is your friend. I agree 100% on the TCPL! My favorite spot is the big table in the Western Americana section with the nice chairs.